Denver stadiums and arenas have some of the highest running costs purely due to square footage and occupant capacity. Structured with floor to ceiling windows, these establishments face some serious hurdles when it comes to energy costs. Keeping an entire stadium or arena comfortable for guests, customers, performers, and staff can be really difficult. Energy efficiency window film offers the best option for keeping these spaces comfortable while helping owners save money and lower carbon emissions. LLumar commercial energy efficient window film is definitely one of our recommendations. 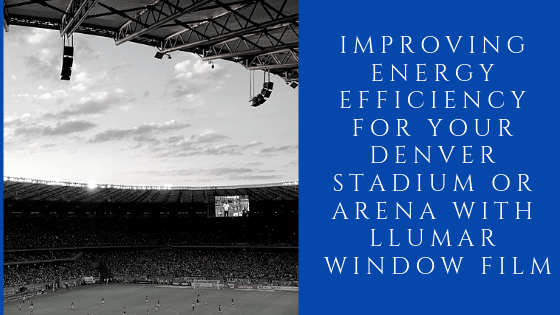 LLumar energy efficient window film offers the significant savings that all arenas and stadiums can appreciate while helping the global efforts in reducing overall carbon emissions. Energy efficient window film provides serious savings in both summer and winter months, helping keep everyone occupying the building happy and comfortable. In addition to reducing HVAC consumption, hot/cold spots are eliminated. UV protection, glare reduction, privacy, and safety and security are all available upgrades with energy efficient window film. LLumar commercial window films offer comprehensive options engineered specifically for businesses and properties of this size. Stadiums and arenas can really take advantage of all these incredible, exclusive benefits that LLumar window film has to offer. Llumar® Window Films for Denver Arenas and Stadiums from Kansas City Green Window Film on Vimeo. GreenLight Window Films is honored to provide our LEED certified team in order to conduct thorough energy audits of your property. Energy audits help you better understand your energy usages and trends. Once we’ve conducted an on-site assessment and received all of your past energy usage data, we submit that directly to LLumar along with our top three product recommendations in order to provide you an accurate, projected ROI. For more information regarding LLumar window film for your stadium or arena, please contact us!